Designed for low impact workouts wear this adidas All Me Flow Ladies Sports Bra in White and Black when to work up a sweat. 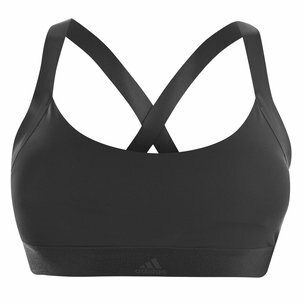 This light support sports bra from adidas feels soft to the touch. It comes light on support by heavy on comfort. The bra will provide you with the comfort and support necessary for workouts such as yoga, climbing and weight lifting. It's made of soft, breathable knit with a seamless fit whilst the under-bust band feels smooth against your skin and the removable pads provide extra coverage.